Six months of orthodontic uprighting (including open coil spring, Omega loop and lingual buttons), there seems to be enough space to place an implant at #30 with new bone formation mesial to #31 and distal to #29 (Fig.2,3 arrowheads). The center of resistance (for rotation) is at the furca (Fig.2 O). The void (*) created with upright is going to be filled. The center of initial osteotomy will be slightly distal (Fig.3 green, parallel to the bicuspid), since more upright will be conducted after implant osteointegration. 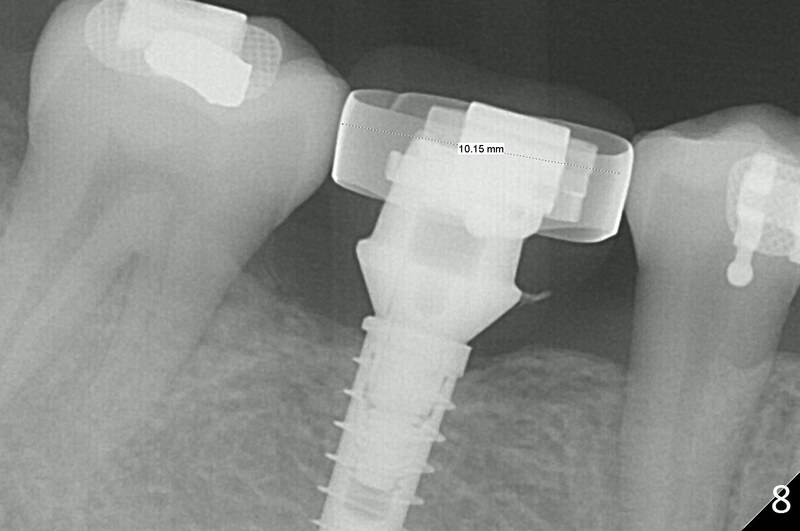 The initial osteotomy depth will be 11 mm. 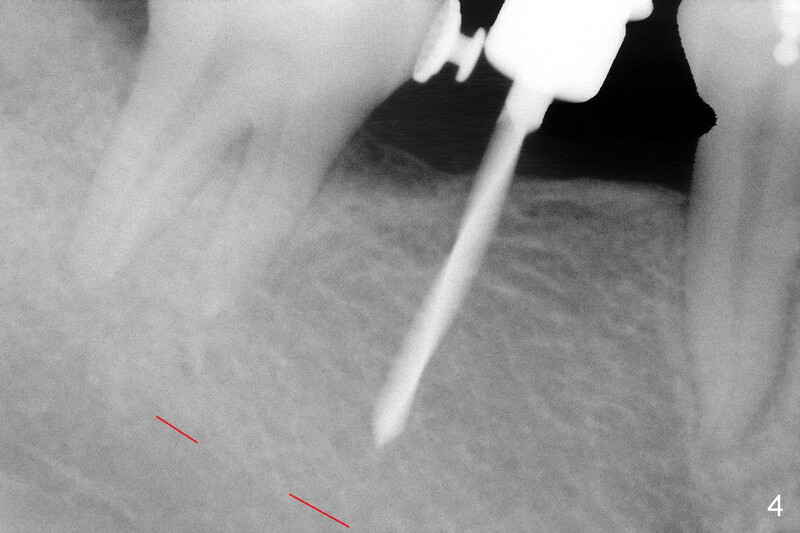 To place the implant slightly deeper (subcretal), the depth of the last 2nd drill will be 13 mm with stopper. 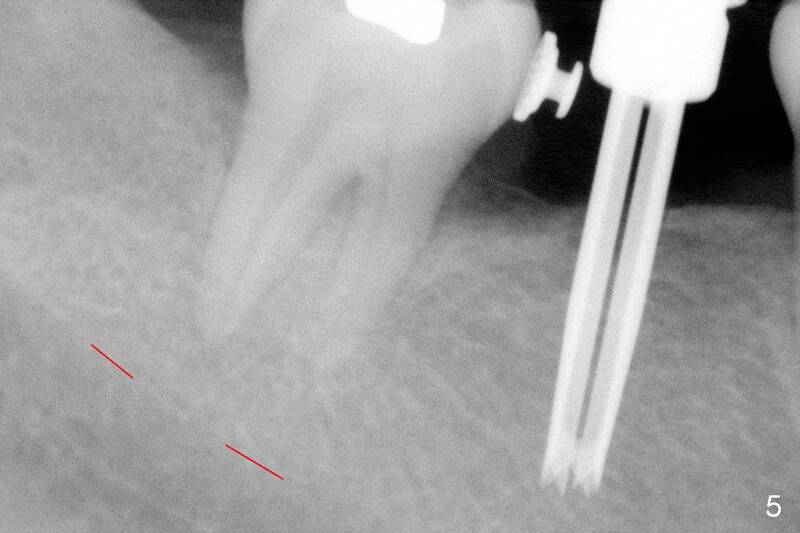 Prior to fabrication of an immediate provisional, place ortho wax around the lingual button of the tooth #31. The ridge is found to be fairly narrow after incision. Bone density is determined to be high using #15 blade. A 1.6 mm pilot drill is used to initiate osteotomy (Fig.4). The latter is moved mesially. 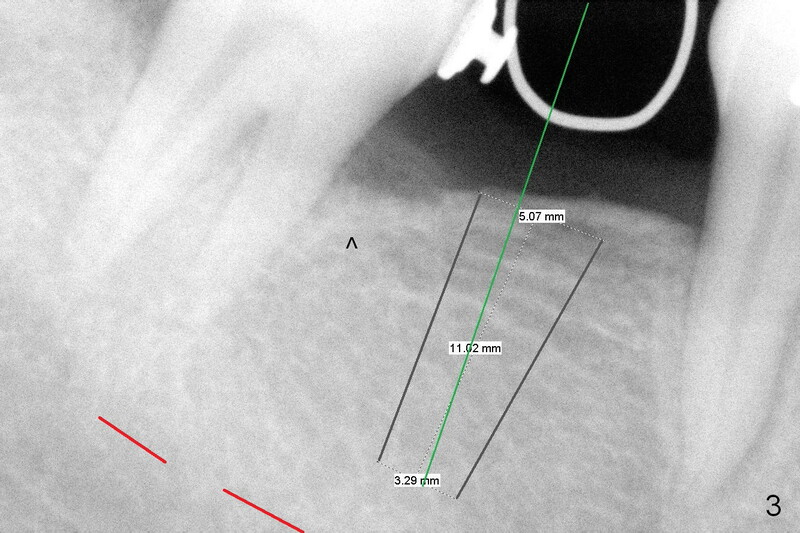 By the time 3.3 mm Magic Drill is in place, the osteotomy is in the better position mesiodistally (Fig.5). 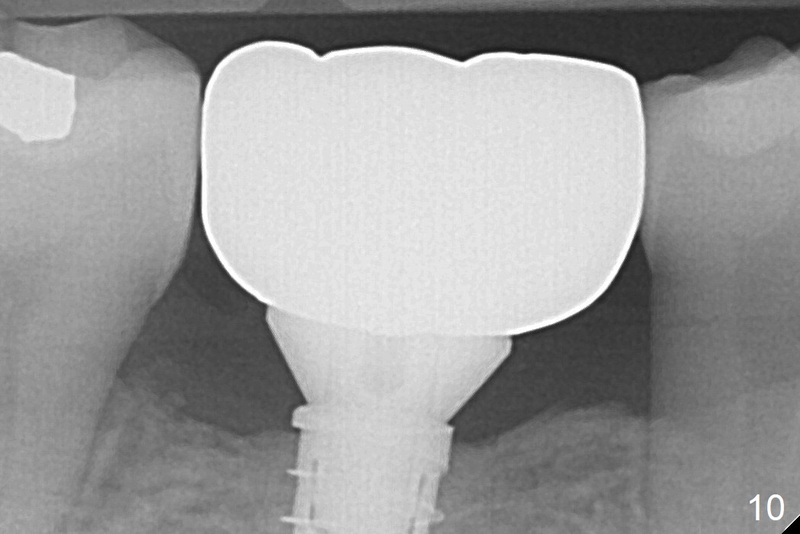 The same is a 4x11 mm IBS implant (Fig.6, >55 Ncm). The lingual button in the mesial of #31 is then removed, because it appears to interfere with placement of a 4.5x4(2) abutment. The position of #31 is maintained by open coil spring. Periodontal dressing is removed ~ 1 week postop. The tooth #31 appears to rotate under the pressure of the open coil spring. One month postop, the patient will return for #30 provisional. 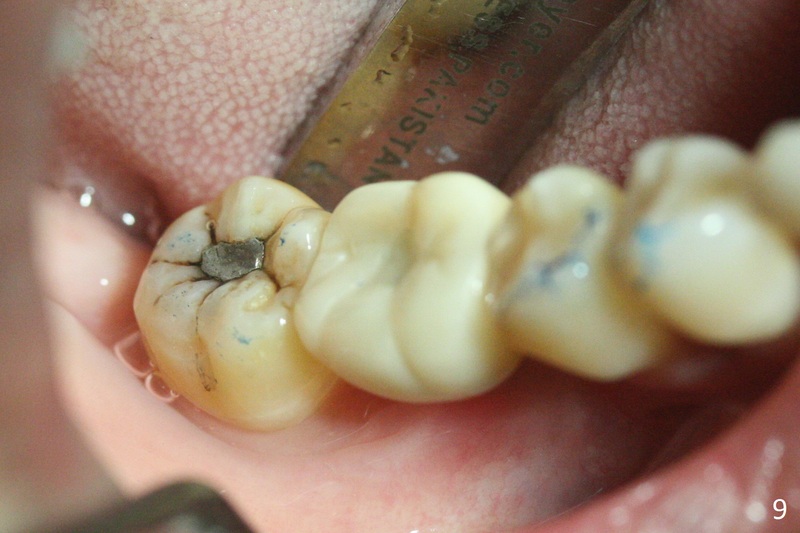 Once the latter is being finished, add composite or new acrylic to the distal surface (if possible, more lingual than buccal) so that the tooth #31 will be distalized. The existing arch wire will be placed with or without open coil spring. A band will be placed at #30 3-4 months postop so that an open coil spring will be placed between #30 and 31. The treatment will terminate when the mesiodistal edentulous space is 9-10 mm. 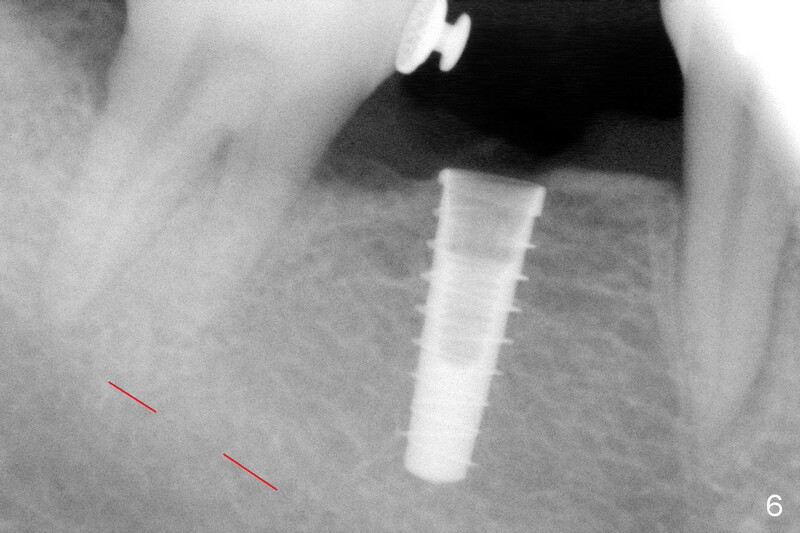 A provisional is fabricated 1 month postop to prevent the tooth #31 from rotation under the tension of the open coil spring, as mentioned above. 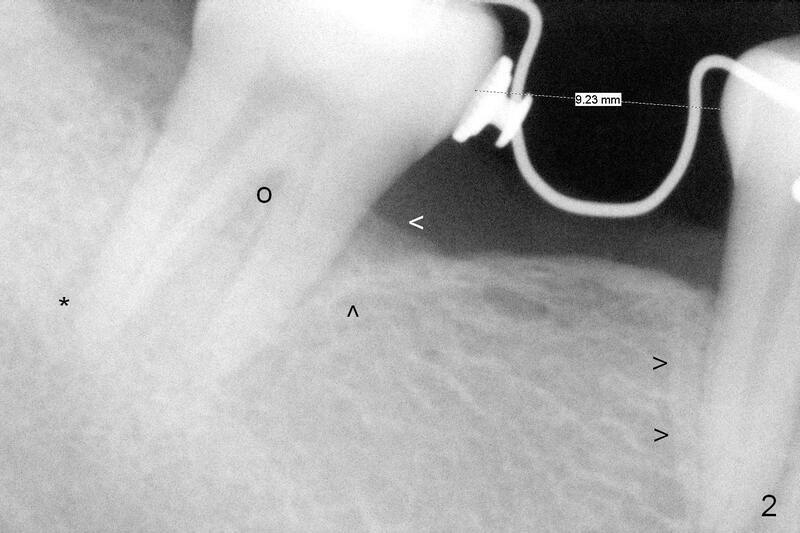 Acrylic is added distal for #31 distalization nearly 2 months postop. 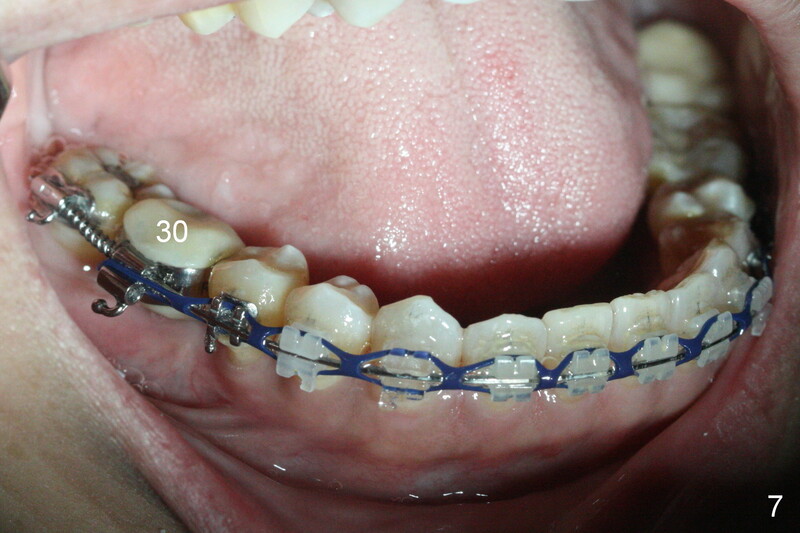 More definitive orthodontic action begins 3 months postop (Fig.7, banding and open coil spring). The edentulous space increases to satisfactory width 3.5 months postop (Fig.8). 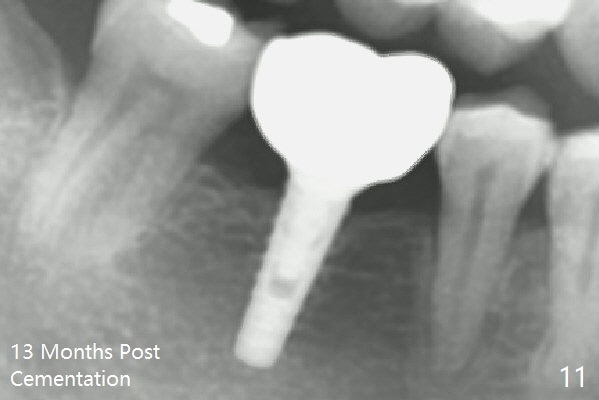 A normal sized crown is delivered 4 months postop (Fig.9). 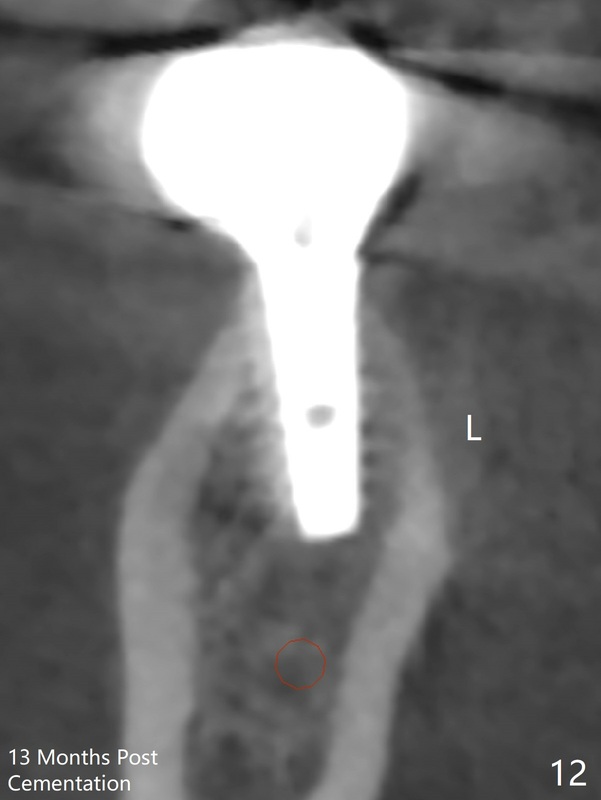 The patient is pleased with the new tooth (Fig.10 nearly 6 months post cementation). 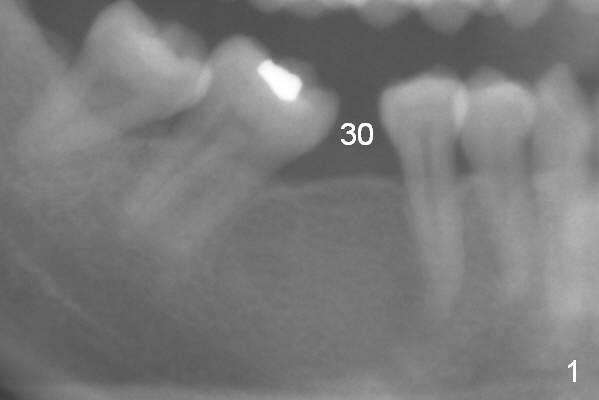 There is no bone loss 13 months post cementation (Fig.11 (pan), 12 (CT coronal section (L: lingual))).